In true knit.wear fashion, the projects and photography in the recently-published Fall/Winter 2018 issue are modern, stripped down, and stunning. Since its inception in 2011, knit.wear has consistently published crisp, clean-looking knits with interesting takes on construction, fabric, and design elements. They aren’t overly complicated, they’re inspired by classic silhouettes, and they are totally luxurious, all while being everyday wearable and totally eye-catching. In this issue, editor Meghan Babin curated three amazing collections of different project types for everyone to love. 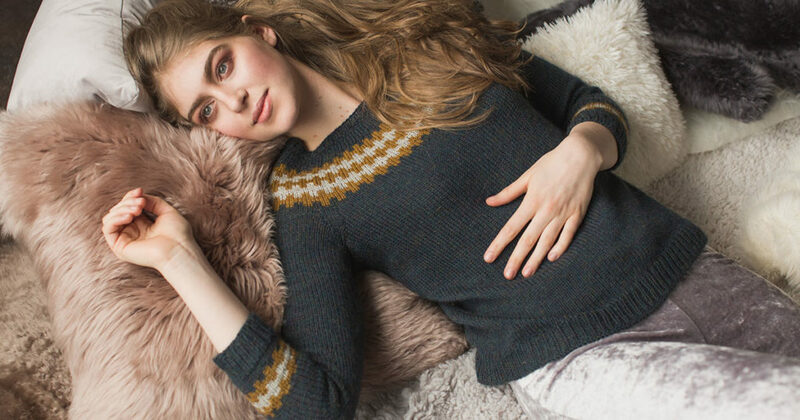 The first collection is all about modern Fair Isle, and includes five gorgeous sweaters that incorporate stranded knitting in contemporary, unexpected motifs. The next story features super cozy cables, with five projects deviating from the super-traditional in favor of modern applications of cabley goodness, of both the subtle and in-your-face varieties. The third and final story is called Back to Basics and features eight projects that use basic techniques to create simple and gorgeous designs. The range of projects in this issue make it possible for any and every knitter to find something here that delights them to ogle at as well as to knit. More advanced knitters (or courageous beginners) who love colorwork will find themselves in their comfort zone with one of the five Modern Fair Isle sweaters. The concentration required for the colorwork yokes and hems is balanced by miles of simple, plain stockinette stitch—perfect for mindless knitting during a podcast or TV show. 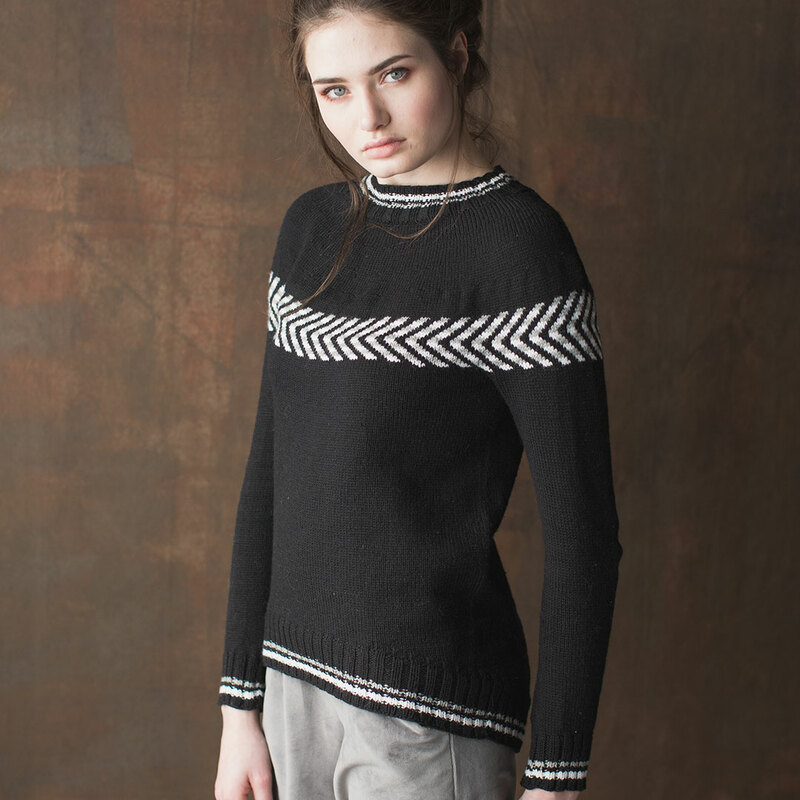 The Pepper and Snow Pullover by Cheryl Toy features small sections of stranded colorwork, accompanied by allover in-the-round stockinette-stitch in one color, down the arms and body. The Comforting Cables projects feature a variety of different, unusual cables, incorporated in four sweaters and one hat. 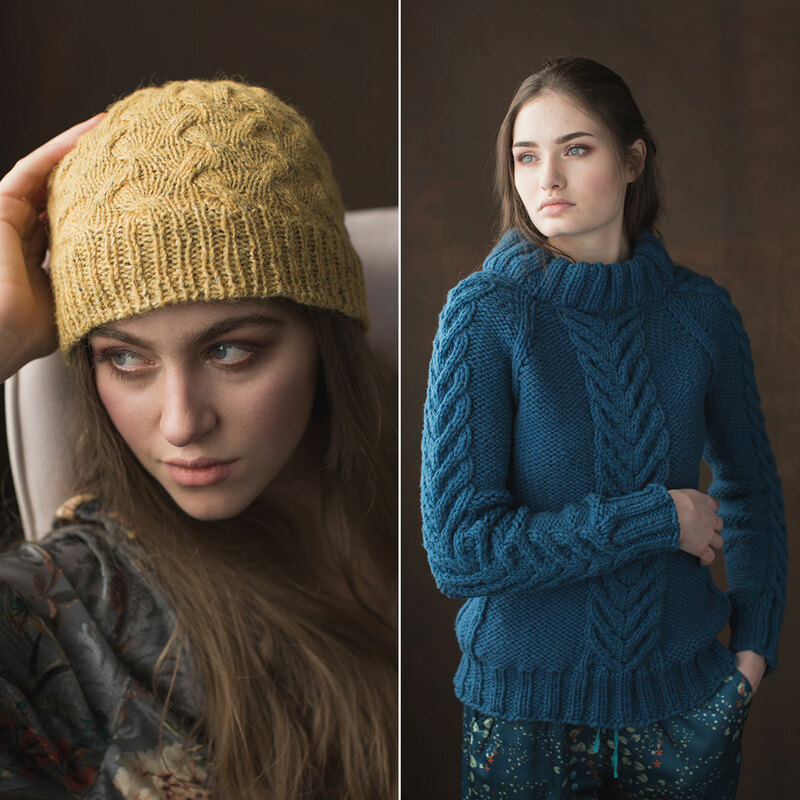 If you’re looking for quick projects, the Twinings Hat by Jennifer Dassau has understated cables that create a beautiful texture, and the Compass Points Pullover by Kephren Pritchett is knit in a bulky-weight yarn with prominent cables and a mock turtleneck. Other, more intense options include the Shifting Squares Pullover by Mary Anne Benedetto, and for a real challenge, cast on Amy Gunderson’s Purple Beet Raglan with fine-weight yarn and size 4 needles! Miles of stockinette on this tunic-length sweater let the subtle raglan cables shine. Get some immediate gratification with The Twinings Hat and Compass Points Pullover. Challenge yourself with the fun Shifting Squares Pullover and fine-gauge Purple Beet Raglan. In the last story, Back to Basics, knitters can choose between eight sweaters and accessories that harken back to the basic building blocks of knitting: knits and purls. 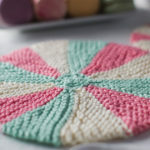 These projects have classic construction and allover stitch patterns that really soothe the soul the way knitting should. The three-quarter sleeve Calderwood Pullover by Irina Anikeeva is a wardrobe staple you can knit in a timely fashion, and the decadent Point Gray Poncho by illitilli is a marathon of garter stripes on the bias. Ribbing, reverse-stockinette stitch, and a small bit of cabling create the simple-yet-fulfilling Calderwood Pullover. 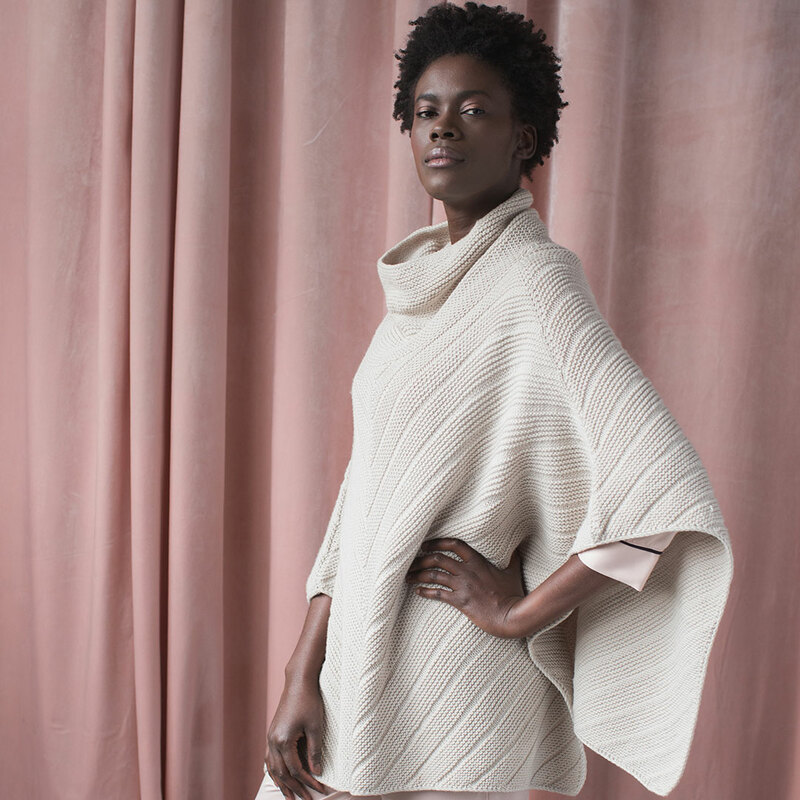 Treat yourself to a super-drapey and comfortable cover-up with the Point Gray Poncho. 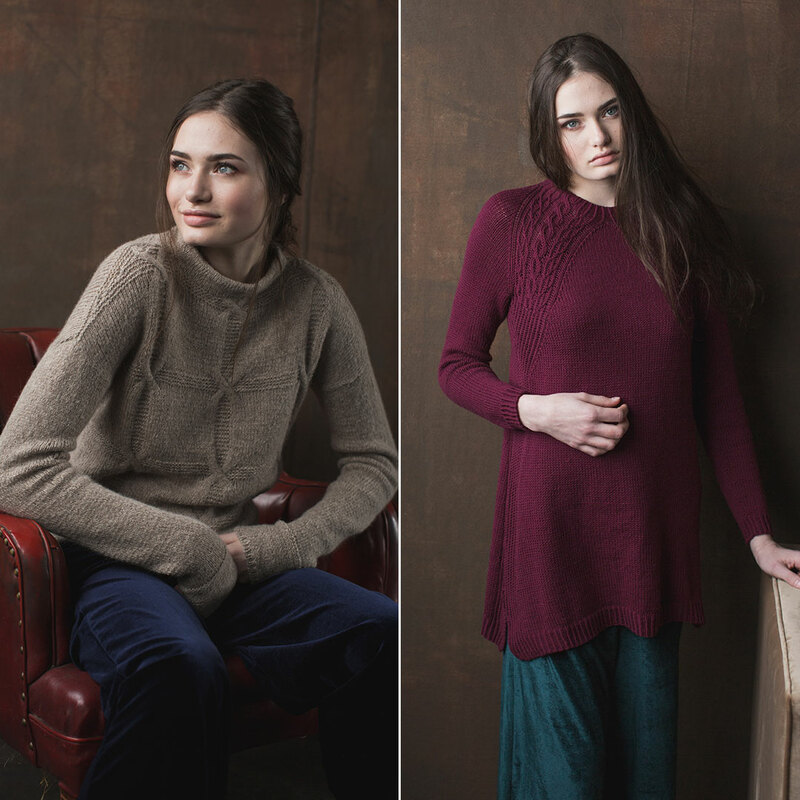 Lastly, this issue of knit.wear includes four patterns from Wool Studio Volume 4: The Norah Gaughan Collection—the Sloan Dress, the Murray Pullover, the Aspen Pullover, and the Maya Cardigan (see the entire collection here). If you haven’t seen these projects from Norah, you’re bound to fall in love and find the perfect project for you. This refined issue of knit.wear has a project for everyone regardless of style, and are accessible despite their designated difficulty levels. Dabble in something new or take comfort in something familiar, and either way, just enjoy your fall knitting. Content originally published 11/7/19. Refreshed for your enjoyment on 3/29/19. Get this final issue of knit.wear—and others—now!